Eli Terry was born before the American Revolution on April 13, 1772 in East Windsor, Connecticut. As a young boy of 14, he was accepted by master clockmaker Daniel Burnap as an apprentice. After serving his apprenticeship, Terry opened his own clock shop in Plymouth, Connecticut in 1793, at the age of 21. In the 1700’s American technology had not yet evolved to support the manufacture of brass so all clocks were made with hand-turned wooden works. 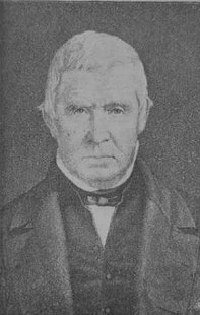 Eli Terry was aware of Eli Whitney’s ideas concerning the manufacturing process like the use of power machinery, the use of interchangeable parts, and the division of labor to create an assembly line. Of course, the history books credit Eli Whitney with the invention of the cotton gin, a machine for cleaning cotton. While Eli Whitney received a patent for his cotton gin on March 14, 1794, it was not validated until 1807. Independent of Eli Whitney’s achievements, Terry applied the concepts of power machinery and standardized parts to his clockmaking enterprise. Terry adapted his machines to be powered by water and hired several employees to cut standardized wheels, cogs, and other clock parts from wood. These were then assembled to make the finished clocks. By 1800 he was producing about 20 clocks at a time in his Plymouth clock factory. Eli Terry brokered a deal with fellow Connecticut businessmen Edward Porter and Levi Porter to build 4,000 clocks in four years, a staggering undertaking in 1807. To accomplish this manufacturing feat, Eli Terry hired or went into partnership with local Connecticut master craftsmen Seth Thomas and Silas Hoadley. Accounts differ as to whether the initial relationship among the men was as employer/employee or a partnership. In any event, the 4,000 clocks were delivered in just three years. In 1810 Thomas and Hoadley bought out Terry's interest in the business. In December of 1812, Terry bought up land along the Naugatuck River which included a sawmill and gristmill. It was here that he developed his shelf clock. It was known as a 'pillar and scroll' clock and was fitted with a wooden movement. In 1814, he applied for a patent to protect his invention and it was granted on June 12, 1816. Until the invention of the pillar and scroll clock, American clockmakers were manufacturing tallclocks, which today we call grandfather clocks. Eli Terry is also credited with the design of the pillar and scroll case, although Seth Thomas may have been using the case style before Terry. Terry and Thomas continued to have royalty disputes over the patent from 1818 until 1829. Always looking for ways to improve on his clocks, Terry developed another model in 1822. This new design had five wheels instead of four in both the time train and the strike train. He also moved the escapement from in front of the dial to under it. The patent for this model was granted on July 5, 1826. Eli Terry’s prowess at factory automation with water power and the use of interchangeable parts boosted production of clocks to about 12,000 clocks per year. Around 1830 brass clock mechanisms replaced wooden ones and Terry soon incorporated brass mechanisms into the clocks produced by his factory while his competitor Seth Thomas continued to manufacture wooden works. Brass clock works made for a more durable clock and Eli Terry began to export clocks to Europe. After his death, his son Silas Terry continued promoting the early clocks with brass movements. He opened his own clock shop in Plymouth, Connecticut in 1831 where he made weight operated, 8-day brass clocks. After 1850, Silas encountered financial troubles. In 1853, Terry & Company was dissolved followed by Terryville Manufacturing in 1859. He was bankrupt. Silas then went to the William L. Gilbert clock company as a designer and engineer where he stayed until 1867 when he moved to Waterbury and started the Terry Clock Company with his three sons. In 1880 the operation moved to Pittsfield Massachusetts where, in 1888, the company's creditors took the firm over. So after 90+ years, the Terry clockmaking era comes to an end.